The second we first bit into this black bean patty during our Gardenburger taste test, we had fantasies about this burrito! Microwave or grill your veggie patty according to the directions on the box (we prefer ours grilled...with nonstick cooking spray, of course!). Spread sour cream on your tortilla. Cut veggie patty into bite-sized pieces or strips. On one half of the tortilla, place lettuce, tomatoes, and veggie patty pieces. 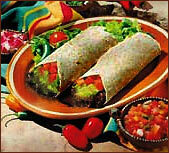 Top with salsa, and roll up your burrito. If you're brave, add some hot sauce. 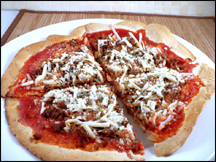 This crispy, fiber-rific, protein-packed pizza will please veggie-mongers and meat eaters EVERYWHERE! Eat one to celebrate National Pizza Month (there are only a few days left!). In a small dish, combine yogurt with salt, pepper, oregano and garlic powder (season to taste). For some added spice, add red pepper flakes. In a skillet sprayed with no-cal cooking spray, cook onions and peppers over medium heat for 5 - 7 minutes. Add spinach and tomatoes, and cook until spinach leaves have lost their volume. Remove from heat, and mix veggies with yogurt sauce. 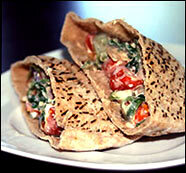 Cut pita in half (toast if desired) and stuff with veggie mix. Having mail issues? Click here for a printable, text-only version of this email. And for an HTML version click here.